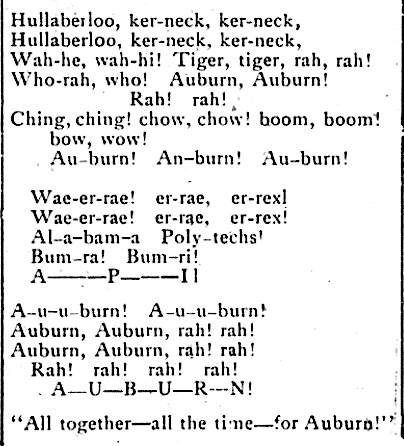 Old Auburn “yells and songs” from 100 years ago. 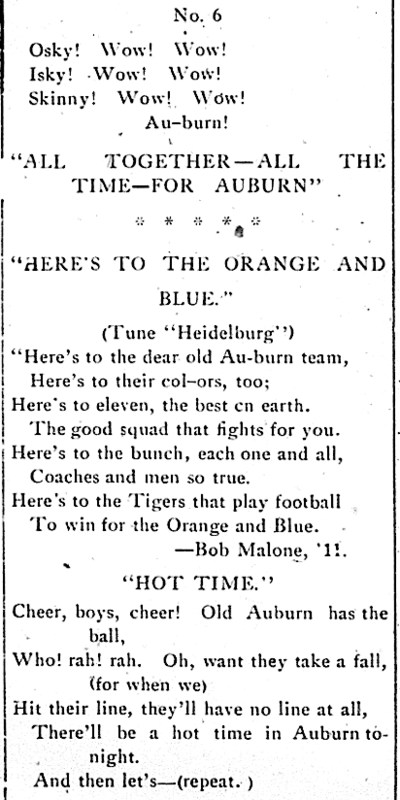 They helped Auburn win a national championship in 1913, maybe they’ll mix some magic into 2013. Learn them. Love them. Skyrocket. Boom. Auburn. This post sponsored by Toomer’s Drugs, sole agents for El Toro and Hernsheim cigars. Related: This 1902 (or maybe 1903) Toomer’s Drugs beverage menu is too fancy for you. After they squared (x+y) in verse 2: “x squre y square 2xy” I was hoping they’d cube it in verse 3 and so on. But any any polynomial reference in cheer has to be saluted I guess.